The CLP-645 starts with great sound. At its heart are meticulously sampled Yamaha CFX and Bösendorfer Imperial pianos along with Yamaha’s NWX (Natural Wood X) keyboard action with escapement and synthetic ebony & ivory keytops. The keys utilize specifically chosen and specially dried wood, giving you the response and feel of a grand piano keyboard. Binaural CFX sampling technology makes playing with headphones an immersive experience in that it recreates the perspective of the player’s position through a set of headphones. Now with Key-Off samples as well as Damper and String Resonance samples, the CLP series has never sounded better. Connect to your iOS device or your computer using the USB port to experience a wealth of entertainment and educational apps. USB audio recording and playback even captures or plays back performances on a USB drive. 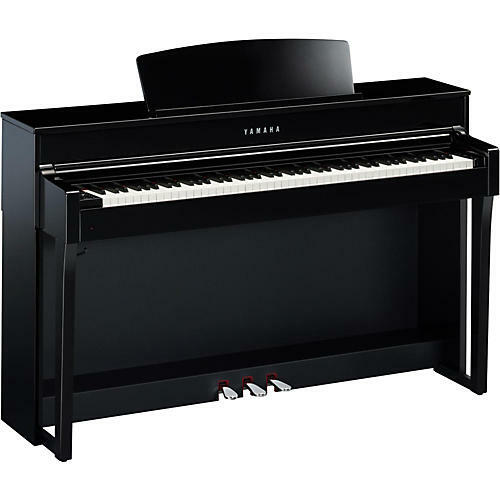 The CLP645 even features Bluetooth audio that allows you to connect your music player wirelessly to your Clavinova so you can listen to and play along with your favorite songs. Binaural CFX Sampling technology delivers a three-dimensional sound that creates the perspective of the player position through headphones. Key-off samples deliver the delicate change in sound the instant the damper falls back to the string, and String Resonance recreates the sympathetic sounds of other strings resonating, emulating to a fine detail the behavior of acoustic pianos. Virtual Resonance Modeling (VRM) allows for vivid and richly varied expression that reflects the many factors contributing to the sound of a concert grand piano. Damper Resonance DSP recreates the sound of the inside of a grand piano when the dampers are off the strings. The combined effect of all of these nuances of the piano samples creates an extraordinarily satisfying musical experience. The CLP-635 also includes drum rhythms that are fun to practice and perform with. They can sometimes be a real and practical alternative to a metronome. A 1/8 in. AUX input takes output from a portable music player, iOS device, mixer or computer and uses the instrument's speakers to play back the audio. An on-board, 16-track recorder allows you to create your own songs using multiple sounds for simultaneous playback.